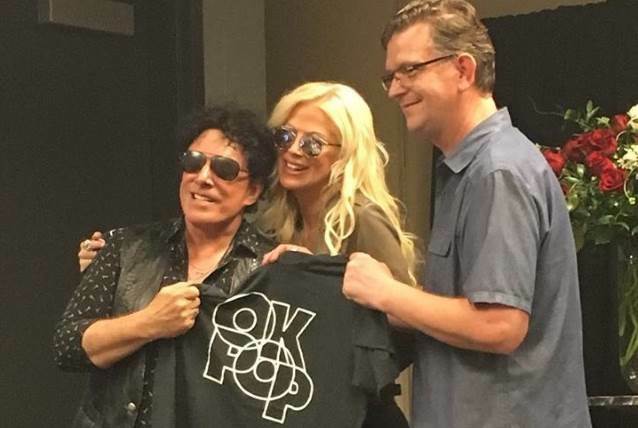 JOURNEY founder and only remaining original member Neal Schon has announced that he will be donating a portion of his personal collection to the highly anticipated Oklahoma Museum of Popular Culture (OKPOP). The announcement was made immediately prior to JOURNEY taking the stage with DEF LEPPARD at the BOK Center on July 9. Said Schon: "We're going to get a nice collection for you all. I'm going to have to go through my zillion guitars and figure out which ones I'm going to ship. I'm also going to get you a giant platinum plaque with all our records on it." At the July 4 Milwaukee, Wisconsin stop of the tour, Schon also invited active-duty soldiers onstage with a heartfelt performance of the "Star Spangled Banner" in honor of their upcoming deployment. Schon founded JOURNEY in 1972 and has been the only consistent member, having participated in every album and tour to date. Schon is a Grammy-nominated guitarist, songwriter, and vocalist who is not only the founding member of JOURNEY but was a member of SANTANA and has performed with a variety of other acts, including BAD ENGLISH, Jan Hammer and HSAS, and has released 10 solo albums, including his latest, "Vortex". His guitar style has been described as soulful and melodic, admired by such fellow legends as Eric Clapton and Prince, who reportedly asked for Schon's blessing to release "Purple Rain", which echoed a similar sound to JOURNEY's "Faithfully". JOURNEY's worldwide sales have reached over 100 million records, making them one of the world's best-selling bands of all time, with a wide selection of chart-topping hits like "Don't Stop Believin'", "Open Arms", "Lights", "Faithfully", and "When You Love A Woman", among others.